MIDTOWN, Manhattan (WABC) -- Thousands of people across the U.S. are marching on President Donald Trump's hundredth day in office to demand action on climate change. In Washington, marchers gathered at Union Square near the Capitol at 12:30 p.m. before marching up Pennsylvania Avenue toward the White House in sweltering heat. The marchers plan to then encircle the White House, calling for action. Organizers of the People's Climate March in Washington said about 300 other protest marches were expected around the country. In addition to the Washington march, over 350 sister marches are being held in the U.S., Asia, and Europe. "This march grew out of the relationship building among some of the country's most important progressive organizations and movements," People's Climate Movement national coordinator Paul Getsos said in a statement Saturday. "There was a simple demand -- act. "Today's actions are not for one day or one week or one year," Getsos added. 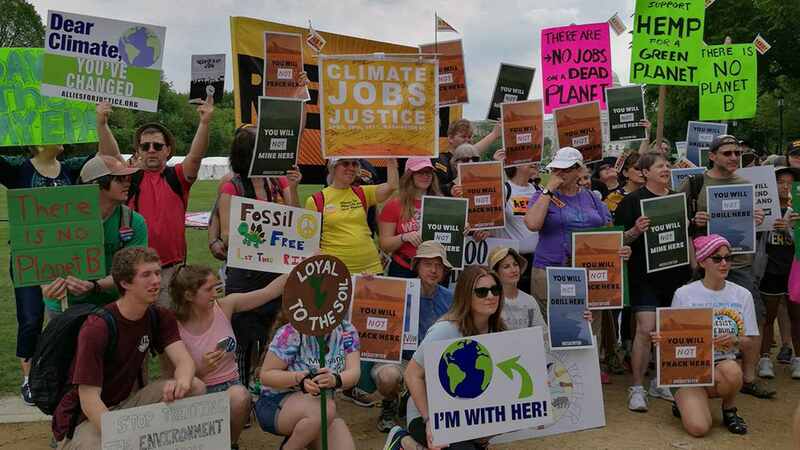 Participants in the People's Climate March said they're objecting to Trump's rollback of restrictions on mining, oil drilling and greenhouse gas emissions at coal-fired power plants, among other things. Many marchers remained near the Capitol, holding signs and banners protesting Trump's environmental policy. Among those marching in D.C. is Leonardo DiCaprio, who tweeted: "Honored to join Indigenous leaders and native peoples as they fight for climate justice. Join me in standing with them. #ClimateMarch." The crowds planned to reconvene at the Washington Monument grounds to listen to music and speakers from around the country, including an indigenous community leader from the Gulf Coast, an Iraq war veteran, a South Carolina pastor, a Muslim imam, a Las Vegas student and a nurse affected by Hurricane Sandy, according to organizers. Two-thousand health care workers from the New York area headed to Washington Saturday morning for the march. They boarded buses on West 43rd Street and nine other locations in the metro area. The United Healthcare Workers East union said they were going to speak out for clean air, water and energy, and for healthy communities. Members also traveled from Massachusetts, New Jersey, Maryland and Washington area. In Augusta, Maine, protesters outside the statehouse said they wanted to draw attention to the damage climate change can cause marginalized communities. In Boston, a crowd gathered in public park in downtown. Marchers carried signs with slogans such as "Dump Trump."